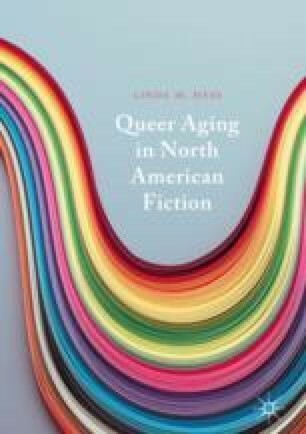 In the Conclusion, the author reflects on some of the new directions that narratives of queer aging are taking in the second decade of the twenty-first century. Having recently found their way into fresh formats, such as stream-TV shows (Transparent; Grace and Frankie), and thus reaching considerably larger audiences than before, representations of queer aging are entering yet a new phase. Hess argues that while current North American cultural imaginaries of aging are nevertheless still largely tied to heteronormative notions of “youthfulness” and “successful aging,” narratives of queer aging will remain pivotal in order to foster productive engagements with a topic that will only gain in significance in the years to come. Gullette, Margaret. 2015. Caitlyn Jenner: The Messages in the Image. Silver Century Foundation, June 22. http://www.silvercentury.org/2015/06/caitlyn-jenner-the-messages-in-the-image/. Accessed 20 May 2016. The Graying of AIDS. 2010. Directed by Katja Heinemann and Naomi Schlegloff. Vimeo. https://vimeo.com/16835914. Accessed 12 Sept 2015.